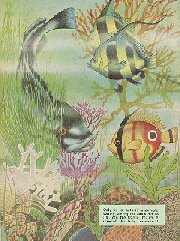 CLASSIC DIVING BOOKS - Juvenile - Boys annuals, compendiums and other underwater stories. Please note: The books are listed for interest only, and not offered for sale. Where does one draw the boundary between 'juvenile' and 'young adult'? Some of these may well be of interest to the young adult, and some deserve a place in the collectors library. 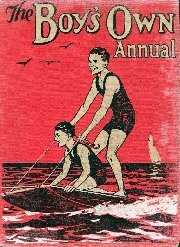 The annual is based on the publication of the (weekly?) periodical The Boy's Own Paper. 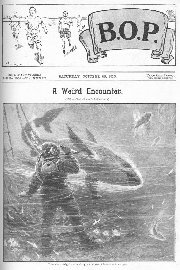 This occasionally contained articles on diving. Published by: The Boys Own Paper Office, London. 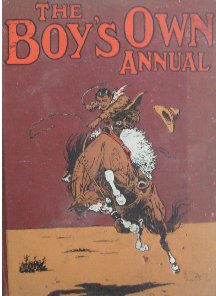 THE BOY'S OWN ANNUAL: VOLUME XLV ( 45). Large A4, hardcover. 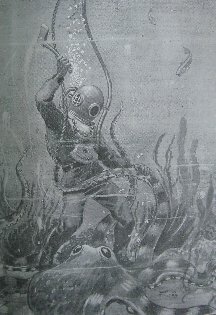 Well illustrated, but only one image relevant to under the sea. 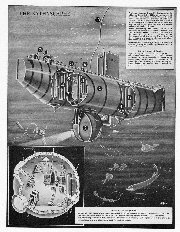 Only the one page of relevant underwater text. Published by: The Boys Own Paper Office, London in 1929/1930 . Hard back, illustrated red covers 864 printed pages. 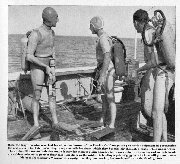 This annual contains a 4 page article in the "Behind the Scenes" series of articles called "Divers and Diving", written by non other than R W Gorman Davis MA, Sir Robert Davis's son. 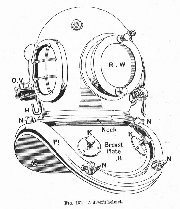 The illustrated article covers subjects like dressing the diver, self contained diving apparatus, submersible decompression chambers and deep sea diving armour. 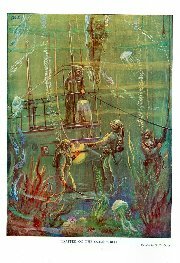 In addition, there is a full page colour print entitled "Trapped om the Sea Bed", showing 5 divers in the throws of trying to rescuse submariners from a sunken submarine. 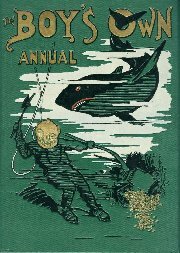 A BOY'S TREASURY OF SEA STORIES. Many authors. Illustrated by Will Nickless. Golden Pleasure Books, London, 1966. Second impression 1967. 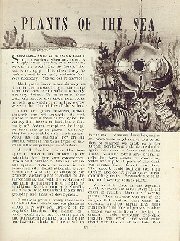 Jointly written by: Cecil J Allen, George Howard, David Le Roi, Dennis May, Walter Shepherd, John W R Taylor and Martin Thornhill. Published by: Hulton Press, London in 1958. Hardback covers with DJ - 192 printed pages. Dimensions: 26 cms tall by 21.5 cms tall. Published by the Victoria state government Education Department. Printed by Government Printer, Melbourne, 1940. Note: For those of you not familiar with Australia, Victoria is a state of Australia. . Published by: George G Harrap, London in 1934. Hardback covers, no DJ, emboossee title and authors on orange cloth front board; gold titling on spine. 288 printed pages. 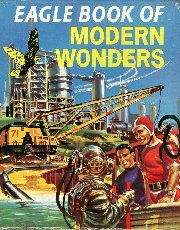 This is an interesting book that gives the younger reader (and maybe the older reader too) an insight into hazardous occupations. 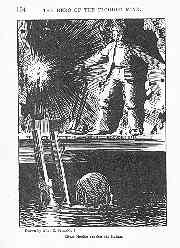 It contains an 18 page illustrated chapter called "Down in Davy Jone's Locker". 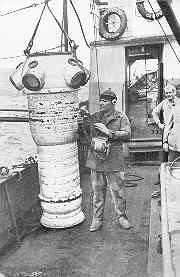 It describes the life of the diver and work done in Scapa Flow, on the Laurentic, the Egypt and others. 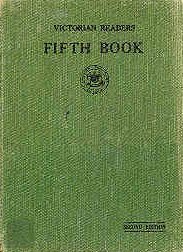 It is divided into 16 chapters, each sepeartely dealing with a hazardous job: "Hearts of Oak" (Lifeboatmen), "The Bravest Men in Blue" (Police), "Heroes of Industry", "Down in Davy Jones Locker", "Britains Fire-Fighters), "When Scentists Take A Chance", Human Flies (Steeplejacks), "Dangers AFloat" (Sea Heroism), "Coalfield Heroes", "Unarmed Pioneers" (Missionarys), "SOS" (Dramas of the Wireless at Sea), "The Railway Roll of Honour", "Everyday Rescues" (Cheating Death on the Spur of the Moment), "Facing Death for the Films" (Stuntmen and women), "Not Everybody's Job" (tunnelers, bridgebuilders) and "gallant Lads" (Scout heroes and some others).The book is illustrated with 29 monochrome plates, two of which ar diving related. pt],ps-nodj] . 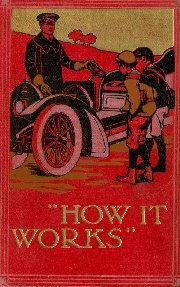 Subtitle: Dealing In Simple Language with Steam, Electricity, Light, Heat, Sound, Hydraulics, Optics, etc. and their Application in Common Use. Hard back illustrated cover - 483 printed pages. Dimensions: 19.5 cms tall by 14 cms wide. Additional comment: My edition is the Thirteenth Edition - Revised, and has the same cover image as shown left but overall green rather than red. It is also undated, but with a woodword class prize dated 1931. 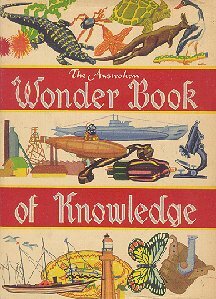 This is a marvellous book and would have been a wonmderful educational aid for young boys and girls at the time - and indeed even now with referenmce to the basic physics. [ps] . Hard back, illustrated cover; 446 printed pages. Dimensions: 20.5 cms by 14.5 cms wide. 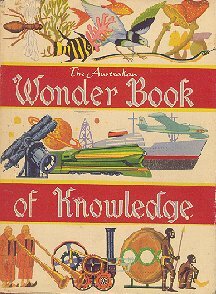 Published by Gunn and Taylor, Melbourne, 1944.. The Complete Novel of the Game Plus 46 Short Stories. Jack London. 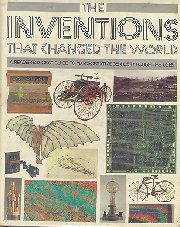 Introduced by Russ Kingman, and compiled by Frank Oppel. Hardcover; dustjacket, 482 pp, b/w illustartions, The book contains the complete novel of The Game, plus 46 short stories including: An Odyssey of the North, Brown Wolf, Love of Life, The Sun-Dog Trail, The Death of Ligoun, Seven Tales of the Fish Patrol, and others. Illustrated hard covers with 159 printed pages. Dimensions: 18.5 cms tall by 12.5 cms wide. 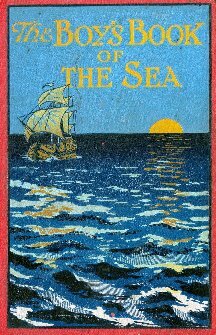 Aimed at the juvenile reader, this compilation book contains factual stories about the sea. 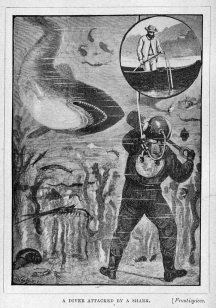 Despite the beautiful illustrated cover showing a diver tackling a shark , there is only partial content about diving - only a small 13 page chapter called "Diving Adventures". 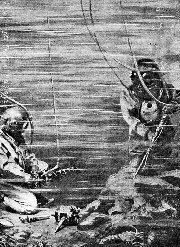 It contains several references to divers at work like Archie M'Gavin tackling "an immense octopus" while laying some wharfe blocks in New Zealand. 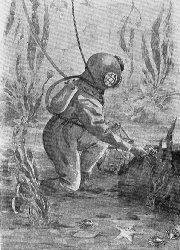 Other divers recollections mentioned include Abraham Onderdond in the USA but the majority of the section on diving relates to the experiences of Andrew Cameron in the UK. 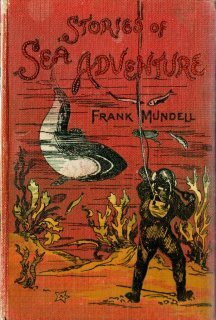 The book is divided into 17 chapters: "Introduction", "Another Robinson Crusoe", "A Death Ship", "That's Not the Way at Sea", "Remarkable Deliverance", "The Wreck of the Oregon", "Castaways", "A Floating Volcano", "Encountering an Iceberg", "A North Sea Adventure", "In The South Seas", "Fifteen Days in an Open Boat", "A Cunarder to the Rescue", "Plucky Sailor Boys", "Unavailing Courage", Rescued from Fire" and Diving Adventures". (Volume One shown on title page, but not on cover nor dustjacket). 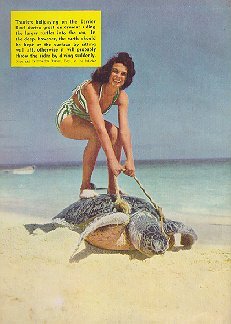 Published by the The News-Pictorial (The Herald and Weekly Times Ltd), Melbourne; no date (c 1950s). 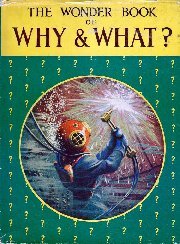 Hardcover, cloth boards, quarto-size, dustjacket (design is same for front and back except for colour images - image shown is of back of jacket showing a hard-hat diver seated rather bizarrely in what appears to be a mini wet-sub; you have to be kidding!!!). Published by: S W Partridge, London c1915. Don't you just love the illustration, right? 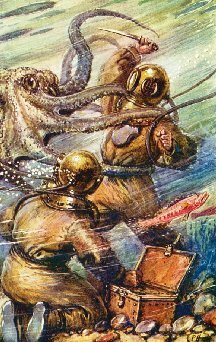 It has it all - a treasure chest in perfect condition sitting on the seabed, and a battle with the proverbial giant octopus. They were the days!!! Edited and designed by The Reader's Digest Association Ltd, London.This first edition published by Reader's Digest Services Pty Ltd, Sydney, 1983. Hardcover, dustjacket, 365 pages, index, mono and colour illusrrations and photographs. Text subject matter in dictionary format, ie in aphabetic sequence. Ward, Lock And Co Ltd, London. 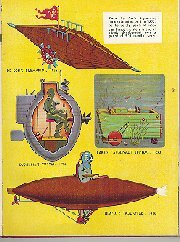 Hardcover, pictorial boards; 256 pages. 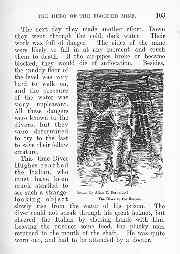 ‘Lots of Historical stories with many illustrations'. 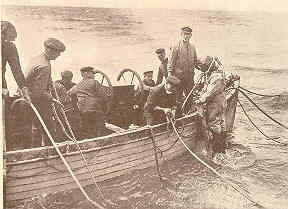 The Bethyshere being dropped into the ocean with two men in it, plus photos. O-12 submarine fitted out to go under the ice in the Arctic, plus photos. Ward, Lock & Co, Ltd. London & Melbourne.Hardcover, 256 pages, no index, many mono photographs, thirteen colour plates. No author listed on title page. Pubished by Dean & Son Ltd., London. No date: suggest 1940s. 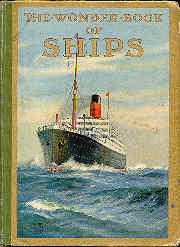 Hardcover, picture boards (no dustjacket), 124 pages, medium format, thick porpous paper, eights pages of mono photographs on gloss paper, including the launching of the Queen Mary, and other ships, many line drawings. This is a boys book, and a very good one it is - I would have been delighed to have read this as a lad. 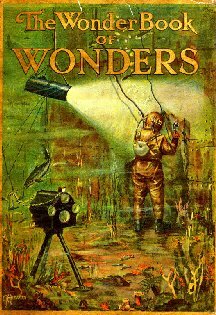 Chapters include Grim Mystery; Race of the Ocean Giants; Pirates of the Panama; Frozen Menace; Brigands of the Seaways; The Secret of Dead Man's Deep; Castaways and Stowayas; Raiding Davy Jones; For the Freedom of the Seas. 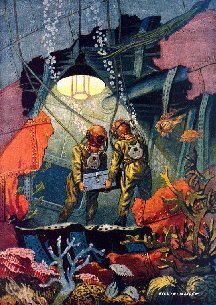 That this is a ‘boy's own adventure' book does not detract from its factual interest for adults, and the ‘Davy Jones' chapter covers the loss of vessels such as the Lutine, Moltke, Birkenhead, Egypt, Lusitania, and Hidenburg. 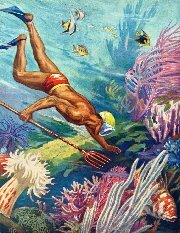 It is likely that the following books have some diving content but I have not been able to cnfirm this. Any advice would be appreciated. 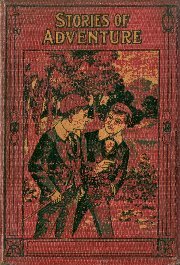 C. Arthur Pearson Ltd London 1902 1st Edition. Hardcover; viii, 318 + advertisements. Scarlet, black, white and gilt decorated boards and spine. Octavo size.Gilt to edges. 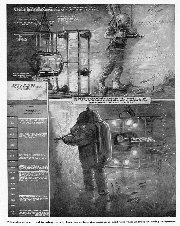 Illustrated with black and white plates.. THE WORLD OF PERIL. STIRRING STORIES OF ADVENTURE. Hardcover, pictorial cloth gilt; 316 pages, twp advertisments, 6 colour plates (3 double-page); Size. 8vo. 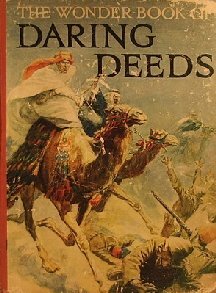 Hardcover, pictorial boards; 192 pages, coloured frontispiece, one full-page colour plate and four full-page black and white plates. The title story consisting of over half the volume is set in Australia.